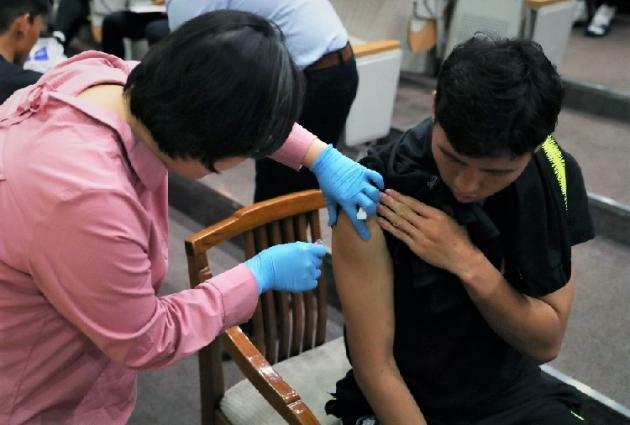 Sanofi Pasteur Korea said Monday it administered three types of vaccines to South Korea’s national soccer team ahead of the 2018 Russia World Cup to protect them against five types of infectious diseases. Around 40 members, including 23 soccer players, coaches and staffs, were vaccinated against meningococcal disease, hepatitis A, tetanus, diphtheria, and pertussis. Sanofi Pasteur Korea, along with Yonsei Severance Hospital and a medical committee under the Korea Football Association (KFA), provides vaccination for the national soccer team, at the National Football Training Center (NFC) located in Paju, Gyeonggi Province. The French pharmaceutical firm worked with the medical committee under the Korea Football Association (KFA) in cooperation with Yonsei University Severance Hospital to protect players from possible outbreaks that commonly occur at mass gatherings. During the 1988 Seoul Olympics and the 2002 Korea-Japan World Cup, the number of patients with meningococcal meningitis quadrupled compared to previous years. Meningococcal meningitis cases ahead of the 2018 PyeongChang Winter Olympics also tripled from 2016. According to the European Center for Disease Control and Prevention, national squads and visitors from all over the world are recommended to get vaccines against certain infectious diseases such as meningococcal disease, hepatitis A, tetanus, diphtheria, and pertussis.